Continuing drops in lithium-ion battery prices mean that electric vehicles (EVs) will be less expensive to own than gas or diesel-powered vehicles as soon as the 2020s, according to a new report. The report, by Bloomberg New Energy Finance, calculated that EVs' total cost of ownership will become cheaper on an unsubsidized basis than that of internal combustion engine cars by the mid-2020s. This will occur even if gas-powered cars continue to improve their average mileage per gallon by 3.5% per year. The study's figures assume that EVs with a 60kWh battery (such as the Tesla Model S) will travel 200 miles between charges. The first generation of these long-range, mid-priced EVs is set to hit the market in the next 18 months with the launch of the Chevrolet Bolt SUV and Tesla Model 3. The Chevy Bolt SUV is scheduled for availability in late 2016 with an expected retail price starting at $30,000. 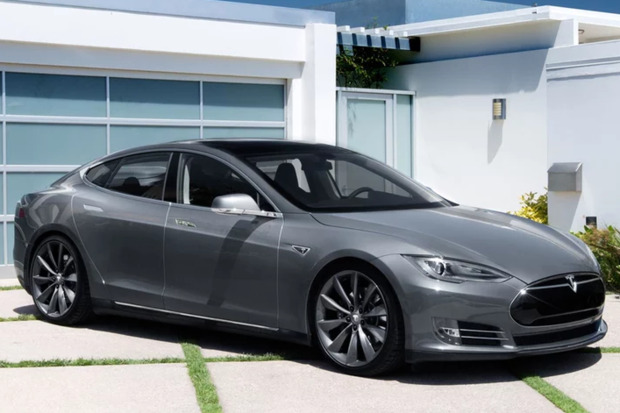 The Tesla Model 3 sedan is expected to start shipping in late 2017 with a starting price of $27,500. (Both vehicle prices include a federal EV tax credit of $7,500.) Both the Bolt and Model 3 will have ranges greater than 200 miles on a single charge. An artist's rendering of the Chevy Bolt SUV, which will retail for about $30,000 after a $7,500 government EV tax incentive. The report also forecasts that sales of EVs will hit 41 million by 2040, up from 462,000 in 2015. By 2040, EVs will make up 35% of new light-duty vehicle sales. "Lithium-ion battery costs have already dropped by 65% since 2010, reaching $350 per kWh [kilowatt hour] last year. We expect EV battery costs to be well below $120 per kWh by 2030, and to fall further after that as new chemistries come in," said Colin McKerracher, an analyst at Bloomberg New Energy Finance. From 2014 through 2015, EV sales should increase by around 60%, Bloomberg's report predicts. Today, EV sales are "heavily dependent" on early adopters of the technology -- drivers who want to reduce their emissions as well as those taking advantage of government incentives offered in markets such as China, Netherlands and Norway. While 1.3 million EVs have been sold worldwide by the end of 2015, and that represents strong growth, the EV fleet still represented less than 1% of light duty vehicle sales last year, according to Bloomberg. A Tesla Model S 60kWh lithium-ion battery pack. One element that has stymied more EV adoption as of late is the falling price of crude oil, which leads to cheaper gas prices at the pump. Today, a barrel of crude oil costs about $33.32, down 76% from a year ago. Bloomberg Finance is forecasting that oil prices will rebound, first to $50 per barrel, and then $70 or higher by 2040. However, if crude oil prices were to fall to $20 and remain there, it would delay mass EV adoption only to the early 2030s, according to Salim Morsy, a senior analyst and author of Bloomberg's study. Along with changing the demographics of the auto industry, however, the adoption of EVs will mean they will displace about 13 million barrels of oil per day by 2040, when the clean-energy cars represent about one-quarter of cars on the road. At the same time, Bloomberg estimated EVs in 2040 will use about 1,900 terawatt hours (TWh or one trillion watts) of electricity -- the equivalent to nearly 8% of global electricity demand last year. "In the next few years, the total-cost-of-ownership advantage will continue to lie with conventional cars, and we therefore do not expect EVs to exceed 5% of light-duty vehicle sales in most markets -- except where subsidies make up the difference," Morsy said. "However, that cost comparison is set to change radically in the 2020s."